OpenCon is a yearly gathering of “open” scholars and advocates in Washington, D.C. to discuss issues, challenges, and share successes in their open work. The goal of the open movement is to make scientific and scholarly research and data readily available for researchers and scholars to view, remix, and reuse. The open research movement benefits everyone. Researchers who share data can learn and develop new research even faster. Open research is also accessible and free to the user, making it that much easier for scholars across the globe to keep up with the latest research. Last fall we announced a partnership with the Office of Research and Strategic Partnerships with the Library to sponsor a PSU faculty member to attend OpenCon 2016 as part of Open Access Week, Erin Flynn. 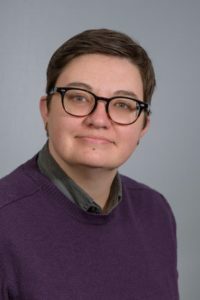 The Library also sponsored attendance of one librarian, Emily Ford, Urban and Public Affairs Librarian at the Portland State University Library. Below, Librarian Emily Ford and Assistant Professor Erin Flynn recount their experiences at OpenCon 2016, and discuss the value of open scholarship. As a librarian it is rare that I get to attend conferences with those outside of my field. It is also rare for me to attend conferences with global reach, engagement, and participation. Attending OpenCon, which brings together scholars and advocates from all over the globe and from all fields, afforded me a singular opportunity to connect with scientists, programmers, NGO workers, educators, students, and policy makers who all coalesce under the same ethos of openness. We believe that making data, educational resources, programs, code, written works, and other information readily accessible can help improve local, regional, national, and global communities. Openness allows global citizens to communicate and build upon one another’s works in ways that were previously not possible. Open Knowledge Maps – An online visualization tool to map open access scientific knowledge. Image Left to Right: Danielle Robinson, Mozilla Science Fellow and Neuroscience PhD Candidate at OHSU; Emily Ford, Urban & Public Affairs Librarian, PSU; Michaela Willi-Hooper, Scholarly Communication Librarian, OSU; Khadidiatou Sall, Founder of SeeSD, Graduate student in Molecular & Cellular Biology at OSU; Daniela Saderi, Neuroscience PhD Candidate at OHSU, Warda Ajaz, Graduate Public Policy student at OSU. Photo taken by Senator Wyden’s staff. Another notable point about the 2016 OpenCon Conference is that it convened on November 12th, 2016 in Washington, D.C. The historic U.S. Presidential Election had just finished, and everywhere the city’s environment acknowledged this. To add to this memory and experience in this odd time, the final day of the conference included an advocacy component. With other Oregon colleagues I went to visit Senator Ron Wyden’s staff to discuss “open.” Senator Wyden is one of the authors of Senate Bill 779, the Fair Access to Science & Technology Research Act (FASTR). FASTR proposes that federally funded agencies with extramural research budgets of over $100 million make readily available manuscripts from that funding. This bill has passed through committee, and could come to vote in an upcoming legislative session. Ben Widness, Senator Wyden’s policy advisor, spent half an hour with us to learn about our open projects and to discuss open issues. Despite our not knowing what a new Presidential administration could mean for open, I feel reassured that in Senator Wyden we have an advocate who wants to help us publicly share scientific and scholarly discoveries and conversations. 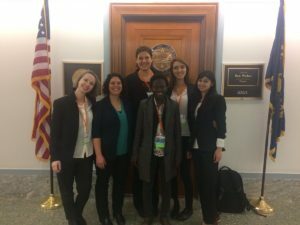 This past November I attended OpenCon 2016, a gathering of researchers, educators, librarians, publishers, policy makers, and students from all over the world. Despite our many differences, we were all dedicated to the proposition that the exchange of information could and should be more open. Intuitively, it makes sense that researchers should make new knowledge freely and publicly available. Every day on my way to teach, I am greeted by Portland State University’s maxim, “Let knowledge serve the city.” And yet, as an early career researcher, I am more likely to be punished than rewarded for taking steps to make the outputs of my work more widely available. Far from serving the city, the insights generated from my research are tightly controlled and available for a fee, unavailable to many of the communities the work is meant to benefit and reach. This at a time when data sets, software, educational materials, and published findings can be shared with technological ease. With the proliferation and wide distribution of “alternative facts” and “fake news,” I cannot help but wonder what a democratic society might look like if high quality, peer reviewed research could be as easily accessed. The academy, a product of another era, has been safeguarding knowledge, relying on old forms to produce, distribute, and value knowledge. This when a revolution in the economy of information has taken place. OpenCon incubates a next generation of scholars. One project at a time, OpenCon converts chip away at the edifice of the academy, rethinking what it means to do valuable work. More than anything, OpenCon 2016 nurtures an ethical commitment to open information, stirring an enthusiasm to inoculate one against another year of working in a decidedly unopen profession. This ethic of openness is not without practical implications. OpenCon attendees reimagine the way that knowledge production is developed, distributed, and valued, realizing that promoting greater openness depends on changing the current incentive structures that limit and inhibit making scholarship freely and widely available. From finding ways to measure, track, and elevate alternative metrics of scholarship to pushing for reforms in faculty review and promotion, OpenCon fosters practical solutions to the way that knowledge is currently conceptualized and valued. Rethinking ways to open access to valuable knowledge has never felt so timely.